If you are looking for a vacation villa that is just steps away from the beach with a full staff and a full range of amenities, then the Bali Dreams Villa will be perfect for your next vacation. With golf nearby, tennis on-site and your own pool, this vacation will be one that you’ll never forget. 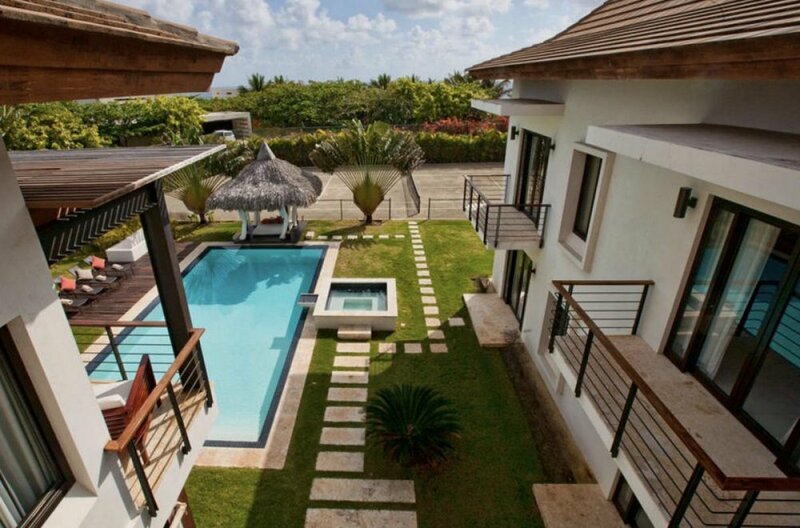 Bali Dreams Villa is a 5 bedroom, 6 bathroom villa covering 7200 square feet in the Orchard Bay Estates. Each bedroom has en suite bathrooms and is fully air-conditioned with individual controls and offer patios/balconies overlooking the private pool and tennis court. The master bedroom has a tub peeking out over the ocean vistas, a outdoor and indoor shower. The private pool is a unique 360 degree infinity edge with a generously sized spa attached. Adjacent to the pool is a shaded outdoor bed complete with pillows for relaxing outdoor. Just steps away from the villa are the beaches of Orchid Bay and a with a short drive you’ll have access to over half a dozen nearby beaches. Additional activities nearby include the famous Playa Grande Golf Course designed by Robert Trent Jones, Sr. This villa sleeps 10 guest comfortably and can accommodate up to 14 guests. Holiday rates for New Years, Easter, American and Canadian Thanksgiving and Christmas are extra, check with us for rates. Rates do not include: island charges of 12%. A short 7-10 minute walk from the villa are the beaches of Orchid Bay and a short drive will get you to over half a dozen more equally magnificent beaches. Staff was excellent, very friendly and accommodating. Osi (host) was always looking to make us comfortable. Alfredo is an excellent chef. Carmen keeps bedrooms clean and it is nice to bring home clean clothes. No need to pack much at all!!! No TVs in bedrooms (which some folks would like), common area did not have functioning a/c which meant doors were open and flies and everything else were inside. No water toys in the pool for adults or children but tennis court was fine. Beach at least a 7-10 minute walk then down some concrete shaky steps. Don’t leave anything behind you won’t want to go back and get it. If you like isolation and peace (and we did for the most part) this is your ideal villa.